Era Of Revolution Women empowerment is one of the hottest topic today. Woman’s have proved themselves in every role and have equally contributed to the modern civilization. 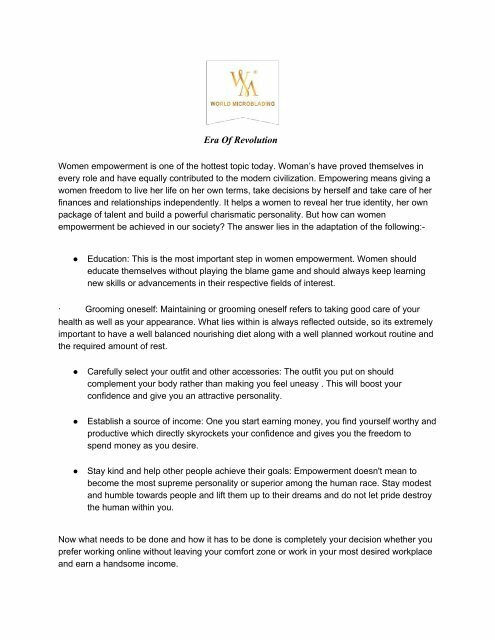 Empowering means giving a women freedom to live her life on her own terms, take decisions by herself and take care of her finances and relationships independently. It helps a women to reveal her true identity, her own package of talent and build a powerful charismatic personality. But how can women empowerment be achieved in our society? The answer lies in the adaptation of the following:- ● Education: This is the most important step in women empowerment. Women should educate themselves without playing the blame game and should always keep learning new skills or advancements in their respective fields of interest. · ​Grooming oneself: Maintaining or grooming oneself refers to taking good care of your health as well as your appearance. What lies within is always reflected outside, so its extremely important to have a well balanced nourishing diet along with a well planned workout routine and the required amount of rest. ● ● ● Carefully select your outfit and other accessories: The outfit you put on should complement your body rather than making you feel uneasy . This will boost your confidence and give you an attractive personality. Establish a source of income: One you start earning money, you find yourself worthy and productive which directly skyrockets your confidence and gives you the freedom to spend money as you desire. Stay kind and help other people achieve their goals: Empowerment doesn't mean to become the most supreme personality or superior among the human race. Stay modest and humble towards people and lift them up to their dreams and do not let pride destroy the human within you. Now what needs to be done and how it has to be done is completely your decision whether you prefer working online without leaving your comfort zone or work in your most desired workplace and earn a handsome income.